I have been a FROG since 2011. I have enjoyed the foreshore work immensely, but I have also welcomed the opportunities which have come my way, due to FROG membership, to take part in land-based traditional digging archaeology. Last year I was part of some exciting stuff; I was one of the volunteers on Bob Cowie’s dig at Sipson’s Quarry. The area was vast, the dig was multi- period, and something new was always turning up. 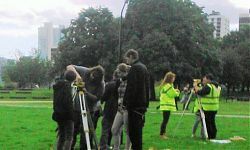 I also dug with PCA at the Fulham Palace Orchard dig, this gave me a chance to acquire new skills such as using surveying levels. I got a further insight into how digs (especially in London) work when I became a volunteer helping out in the archives at Museum of London Archaeology (MOLA). Again this was a FROG connection, as they host the Thames Discovery Programme. 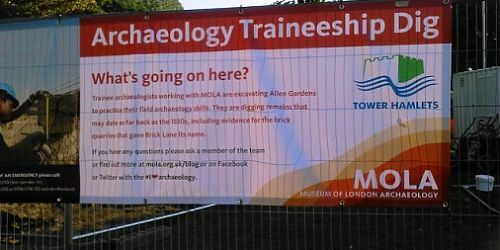 Therefore, when MOLA announced they were looking to employ Trainee Archaeologists and that their main qualifications should be that they were Londoners who were interested in field archaeology and in their community, this seemed to be a logical extension of my work both as a FROG and a community volunteer; a chance to get my dream job, even! I applied, and after a selection process which reminded me somewhat of ‘The Apprentice’, there I was with twelve other lucky people, all excited to be trainee archaeologists- and two of us were FROGs! Then came two hectic weeks at Mortimer Wheeler House with our instructors, Dave Sankey, Senior Archaeologist in charge of the project, and Leo Thomas, also a Senior Archaeologist. The training was in all the basic stuff we would need every day working in the field, we learned the mysteries of how to plan in grid squares, and how to use the oddly named Dumpy levels. 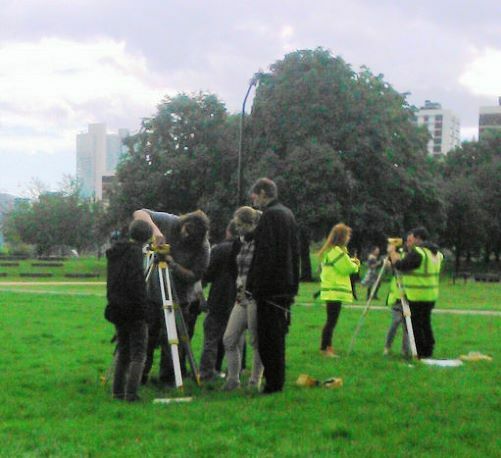 I am sure that the good folk who live round Shoreditch Park are used to seeing archaeologists around, but I think they were a bit bemused by seeing us training our levels on the seating areas in the park! We also visited The Geffrye Museum, The Museum of London, the bastions of London Wall, also the Roman Amphitheatre at The Guildhall. This was, of course, part of our training, but it was great fun as well, helping to bond us into a team with our instructors, or supervisors as they would become on site. After this intense period, the great day came: after a short hiatus of rotten weather and contractor delays, we had a Site! This is in Allen Gardens, just off Brick Lane. 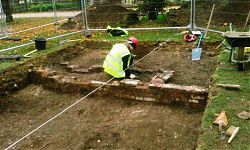 The main objective of the dig (apart from teaching us our trade) is to explore the remains of a school house that used to be there. However, the history of the area goes back further than that, it is thought that the area covered by the park used to be brickfields, hence Brick Lane. In times earlier still, it was used as a rubbish collection and disposal area for the entertainment area of Shoreditch. This contained two major theatres, and one will be the subject of a major excavation by MOLA. The contractors building the major new development there want to showcase the remains as a highlight and feature. We visited the site, and this gave us our first taste of the noise and bustle of a commercial project. Large machinery and demolition rubble were everywhere and, to me at least, the whole thing looked vaguely post- apocalyptic. Given the history of the area, is it possible that our little training dig could maybe have a Tudor midden or three? It’s an exciting idea, but at the moment we are concentrating all our energies on the late 19th and early 20th Centuries, because at the moment we are only down that far! Now here is a demonstration of the suddenness with which things can happen in archaeology; since I wrote those words, we have found a clay pipe from the 1640’s! But also a Victorian or later inkwell, which confirms that we are indeed down on a school. Working in Spitalfields, just off Brick Lane, has been a new experience for me. 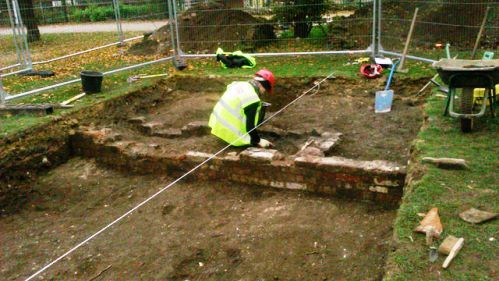 I have helped out at digs and foreshore sites all over London- except for the East End. The area is Bohemian in character, with lots of little cafes and designer shops, and the buildings have spray can graffiti which spectacular enough to be described as murals, but because of their nature, they change all the time. Near the site is a friendly city farm, a really cool place to hang out and chill out at lunchtime. And the soup is amazing! Perhaps I feel an affinity for the place through (unconfirmed) Huguenot ancestors, but this must remain romantic speculation. To some of us the hours kept by commercial archaeologists have come as a rude awakening. I am not, and never will be, a morning person, but on our first week on site, I loved seeing the sun rise over Docklands as I wobbled through it on the DLR. The intensely physical nature of the work surprised some people, and even though I had experience of this kind of archaeology, I was very out of practice, so it was a real struggle at first. But at the end of the day, the reward will be worth it. Already we have met MOLA archaeologists who have told us we will emerge from our training better prepared and more knowledgeable than they did. We are also trailblazers for a new generation of archaeologists and a new way of training them. 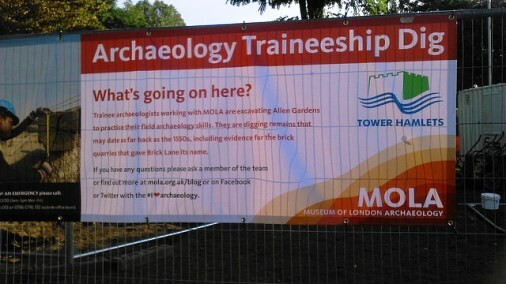 We will emerge with an NVQ Level 3, and an Archaeology Skills Passport, and these will take us anywhere we want to go. It may all seem a long way from the Thames foreshore, but in truth, so much I learned there is relevant to any archaeological investigation in London. At the moment I am happily combining the FROG and the traineeship – on Saturday I was on the Charlton foreshore for a monitoring visit, with my long standing pals from the Greenwich FROG!